The latest monthly update for TERA has officially gone live, with “Guardians of the Sky”. The unfriendly skies await, with the introduction of a new type of open-world Guardian Legion missions. These have players repelling invading alien forces and defending the beloved Sky Whales. There are two new Guardian Legion missions, and promise to test players mettle, ultimately confronting the mothership of these aliens for a final showdown. There are also dragon mounts are also in the TERA STore for players who want a more menacing ally to show off while in the heat of battle. The Demon’s Wheel dungeon also returns as a temporary event, with a chance for players to earn special rewards each week and some ultra-rare, limited quantity drops for lucky groups favored by the mighty Demoros. This begins on Thursday, August 15th, and will be open each week from Thursday through Tuesday, and will end on Tuesday, September 11th. The cosmetic drops in question will grant permanent versions of select mounts and footstep animations to all members of the group, while five extremely lucky players will earn the rarest reward: the azure phoenix flying mount. 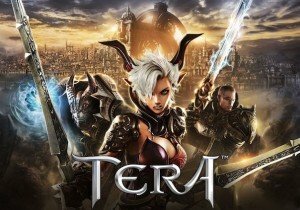 August has much more going on for the TERA community than the Guardians of the Sky update. Coinciding with the monthly leveling event for the priest class, rewarding bonuses for players leveling old priest or newly created priests, players can enter a priest-themed loading screen art contest, submit priest-centric game guides, and engage in more creative efforts for rewards and recognition. For a full list of community and in-game events taking place in August. More info can be found in the link below. Brig-12 is a pretty fascinating creation, and I like the concept of it immensely. It’s a free-to-play single-play CCG/Strategy Game.